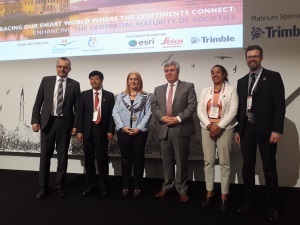 As part of FIG Congress 2018 the FIG General Assembly 2018 was held with a record number of delegates. In the first General Assembly on 6 may 59 member associations were represented, and in the second a total of 73 member associations were present during the General Assembly and the votings. 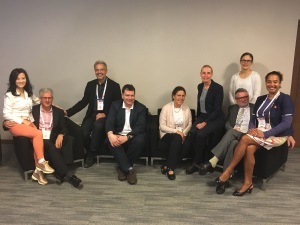 The Congress 2018 marked the final year for FIG President Chryssy Potsiou and her council as well as commission chairs. A special thanks to the nominated - the general assembly had to make a difficult choice between very good and qualified candidates. The incoming commission chairs from left: Winnie Shiu (com1), David Mitchell (com2), Hartmut Müller (com3), Dan Roman (com 5), Maria João Henriques (com6), Marije Louwsma (com8), Melissa Harrington (Young Surveyors), Ben Elder (com9), Diane Dumashie (council representative to the Commission chairs). A large thanks to the current commission chairs for their hard and efficient work during the last four years, and a warm welcome to the chairs elects. 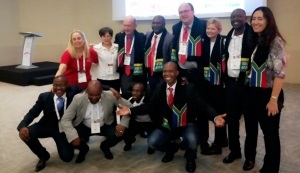 The local organising committee 2022 - Cape Town South Africa. The election for the destination for the FIG Congress 2022 was looked very much forward to as it was very difficult to predict the possible winner. It was a close run, and the persons behind both bids: Orlando, Florida and Cape Town, South Africa had done a lot to promote their destination both beforehand and during the congress. This part made the congress even more exciting and lively. Finally it was decided by the General Assembly that the Congress 2022 will take place in Cape Town, South Africa. Thanks again to both bidders for submitting a bid and for the very good and special atmosphere that you created during the congress.